Hubby has been suggesting for years that I try my hand at a chicken curry. He remembers how great it was as a kid when his grandmother would make it for the family. Now, I’ve never made chicken curry (EVER) so I really shied away from it over the last 5 years. Then I thought about what a healthy dish it could be in the New Year since it’s low in fat, low in carbs and even gluten-free to boot!! SCORE!! What an amazing dish this turned out to us, guys!!! I did substitute chicken broth for the water to enhance the flavor even more. 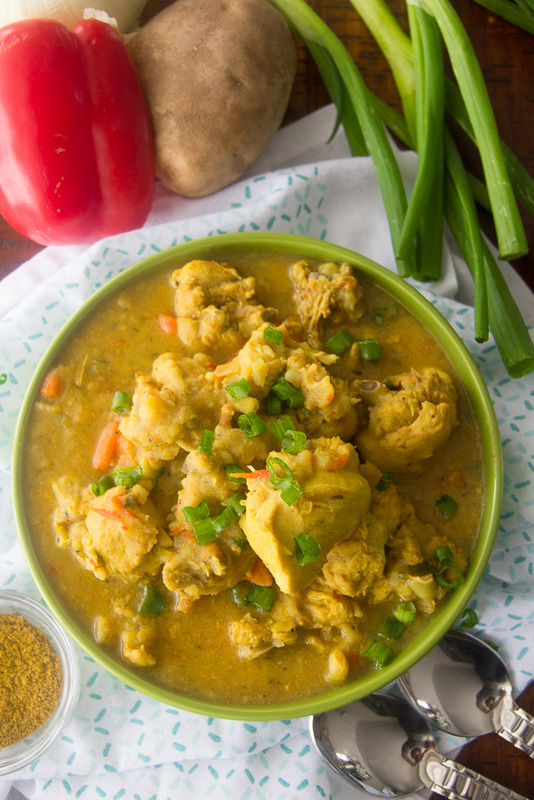 Myself, Hubby, Momma and Daddy all loved this Jamaican Chicken Curry. It was even better the next day after all of the spices had developed and married together. 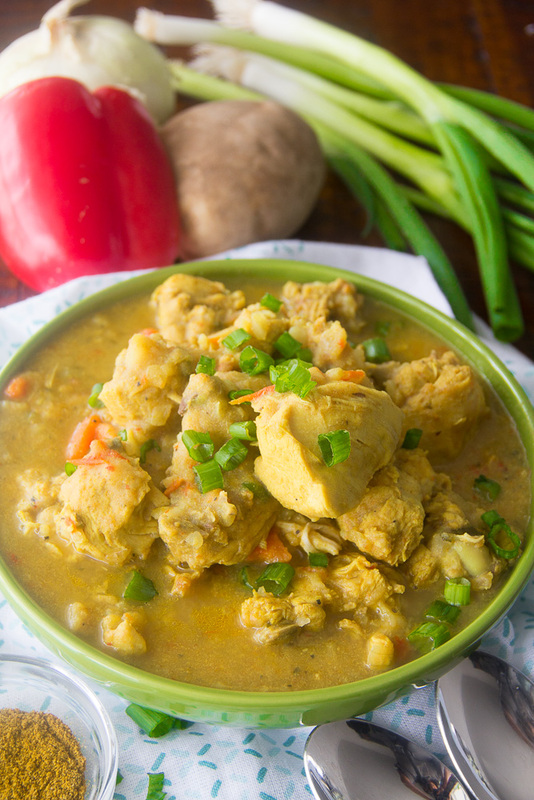 This Authentic Jamaican Style Chicken Curry had excellent depth of flavor from this Trinidad and Tobago Chief Curry Powder. It’s the same curry powder that Winnie used in her super yummy Nigerian Spaghetti. I also took Fay’s suggestion and picked up some of this flavorful West Indian Pepper Sauce. This pepper sauce is so BOMB. I find myself putting it on everything now. If only, I could get it in key-chain size. Lol!! Speaking of depth, Paul prayed that we “have the power to understand, as all God’s people should, how wide, how long, how high, and how deep His love is. That we “experience the love of Christ, though it is too great to understand fully. That we “be made complete with all the fullness of life and power that comes from God.” – Ephesians 3:18-19 (NLT). Wow! God shows His love for us in so many ways. I encourage you to start to recognize all of the little and big ways that God shows His love to you this week my friends. Say Grace and enjoy!! Looking for healthier recipes for the New Year? Check out my, Deliciously Healthy 30 Minute Meals Cookbook!! Cutting through the bones, cut breasts into about 4 pieces, thighs into about three pieces, drumsticks in half and remove and discard wing tips from the wings. Discard all of the skin. Pour lemon juice over the chicken pieces and wash in cold water; draining well then patting dry with paper towel. Season chicken with 2 tsp. kosher salt, black pepper, 3 T. of curry powder, garlic red bell pepper, onion, scallions and tomato. Mix well. Cover and place chicken in fridge overnight or at least for a couple hours. Pour olive oil into a heavy bottom Dutch oven over high heat. Saute cumin seeds for ½ minute. Add 3 T. curry powder, thyme, pepper sauce, 3 Tbsp curry powder, 1 tsp salt and ketchup. Add 1 cup of chicken broth and, when sauce is boiling, add the chicken and vegetables. Stir until covered with sauce and all of the seasonings. Add 1½ cups chicken broth; cover and bring to a boil. Reduce heat to medium, adding potatoes, carrots and add ½ cup of chicken broth. Cover and simmer for about a half hour or until the chicken is tender and sauce thickens. Taste and adjust with salt and more pepper sauce, if needed. Say Grace and enjoy over rice and peas! 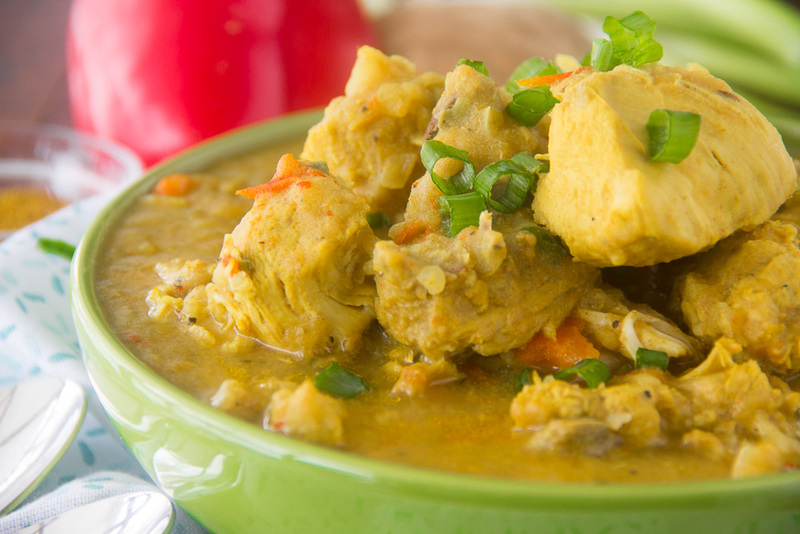 Looks like you did a great job on that Curry Chicken! I tried this today and it was so good and so full of flavor! Thank you so much for sharing! Wonderful!!! One of my favorites!! You are most welcome! !